When looking for a dependable bus rental in Gilbert, look to Phoenix Charter Bus Company to fulfill your transportation needs. Whether you need transportation for a wedding, school trip, corporate outing, or church retreat in this bustling suburb, Phoenix Charter Bus Company is ready to help you plan transportation with ease and convenience. Call us today at 480-445-9823 for a free, instant quote! 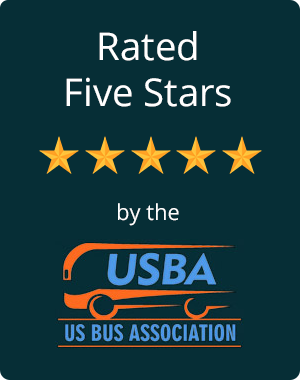 Phoenix Charter Bus Company’s wide-ranging access to coaches of all types makes us the top choice for bus rentals in Phoenix, Glendale, Mesa, Scottsdale, and the surrounding areas. When it comes to Gilbert bus rentals, Phoenix Charter Bus Company can be counted on as a leading transportation resource for all types of groups, including businesses, school groups, and church groups. Simplify your travels to destinations such as Riparian Preserve at Water Ranch, Agritopia, and Freestone Park with a luxurious bus rental from Phoenix Charter Bus Company. Each bus we charter is stocked with essential amenities to make your trip across the Valley of the Sun a great one. From WiFi to air conditioning to PA systems to reclining seats, your bus will keep your group cool and comfortable in Arizona’s famous heat. Enjoy the ride as your professional driver handles all the driving and parking of your trip. Look out your panoramic windows at the scenery and rest assured that your belongings are safe in your coach’s spacious luggage bays. Have some group members with overactive bladders? An on-board restroom will keep everyone in your group happy as you forgo making long pit stops and head straight to your destination. When traveling in a group, it is essential to avoid unnecessary delays, as the more time you have, the more your group will enjoy every aspect of your trip. Our team is standing by at 480-445-9823 to give you a free estimate and to finalize the details for your travels. Are you planning a field trip in Gilbert? Phoenix Charter Bus Company has fulfilled more than a thousand trips in Greater Phoenix and surrounding areas, making us a prime choice for your school trip transportation needs. A creaky old school bus won’t provide the comforts of a professional chartered coach, including personal power outlets for the teens in the group, three-point seat belts for the younger kiddos, and PA systems for the chaperones taking care of your group. Keep your school group comfortable as your tour Gilbert’s famous Agritopia, or head out of town to cities such as Tucson and even out of state to Los Angeles, should you want to experience educational opportunities not found locally. Our team members are experts in arranging both short-haul and long-haul trips. Traveling overnight? We’ll take care of every aspect of the trip for you, allowing you to take a nap on the bus. Industry regulations require that drivers don’t work for longer than ten hours, so we recommend finding a suitable stop for every night you travel. When booking an overnight trip, don’t forget to find comfortable accommodation for your driver! Since 2012, Phoenix Charter Bus Company has matched countless happy brides with the perfect driver for their weddings in Gilbert and other local destinations such as Mesa and Scottsdale. Whether you’re staying in town for the ceremony or going out of state to celebrate this new season of your life, Phoenix Charter Bus Company is thrilled to help you find the best bus rental to shuttle your guests to the venue of your choice. For 50 guests or more, a 56-passenger coach will be best, as it provides ample luggage space and elbow room for those looking to stretch out. If you’re holding an intimate wedding with around 20 guests, then consider the 25-passenger option, which can also come with amenities such as flat-screen TV’s and power outlets at your request. No matter what you choose, Phoenix Charter Bus Company will be here to meet all of your requests and needs. Simply looking for a charter bus rental for your group outing? Or are your employees looking for a way to attend an out-of-state convention? Phoenix Charter Bus Company is prepared to help you find transportation for any type of group outing in and around Gilbert. Call us today at 480-445-9823 to get your booking started!